Honor Among Lovers (1931) - Romantic melodrama from Paramount Pictures and director Dorothy Arzner. Claudette Colbert stars as Julia Traynor, secretary to wealthy business mogul Jerry Stafford (Fredric March). The two work great together, but when Jerry reveals that he has romantic feelings for her, Julia states that she has a boyfriend, Philip (Monroe Owsley), and that they are to be married. After some time in drunken commiseration with his dissolute pal Monty (Charlie Ruggles), Jerry comes to accept the union of Julia and Philip, and even allows Philip to invest money for him, which leads to problems for everyone. Also featuring Ginger Rogers, Pat O'Brien (in his feature debut), Ralph Morgan, Avonne Taylor, Janet McLeary, John Kearney, and Leonard Carey. Source: YouTube, in 14 parts and of dubious quality. 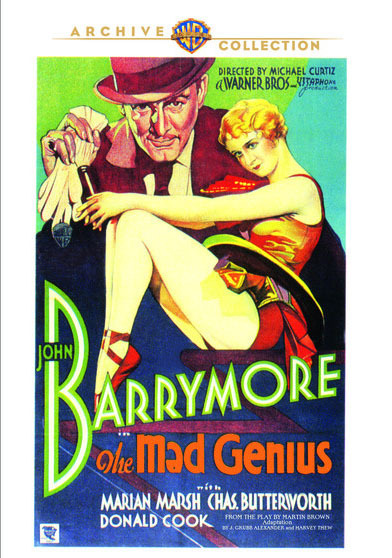 The Mad Genius (1931) - Lurid, Svengali-esque tale from Warner Brothers and director Michael Curtiz. John Barrymore stars as Vladimar Tsarakov, a crippled dance enthusiast who runs a traveling marionette show with his partner Karimsky (Charles Butterworth). After a show in Central Europe, they notice a young boy (Frankie Darro) being chased by his abusive father, with the boy displaying strength and grace of movement. Tsarakov smuggles the child away, and raises him to adulthood. Named Fedor (Donald Cook), the young man has become perhaps the greatest name in ballet, but his life is completely dominated by Tsarakov, who does everything in his power to make sure the young man stays focused, even if it means chasing away his new beloved Nana (Marian Marsh). Also featuring Luis Alberni, Carmel Myers, Andre Luguet, and Boris Karloff. Man of the World (1931) - Romance in Paris from Paramount Pictures and director Richard Wallace. William Powell stars as Michael Trevor, an American expatriate living in Paris and secretly running a blackmail ring. He and his two cohorts target rich tourists and put them in compromising situations, threatening to reveal their indiscretions if a payout isn't made. After targeting one such unsuspecting dupe (Guy Kibbee), Michael meets his beautiful daughter Mary (Carole Lombard) and promptly falls for her. Although his new love makes him reconsider his lifestyle, will his sordid past make a brighter future impossible? Also featuring Wynne Gibson, Lawrence Gray, George Chandler, and Tom Ricketts. Source: Universal DVD, part of the Carole Lombard Glamour Collection. 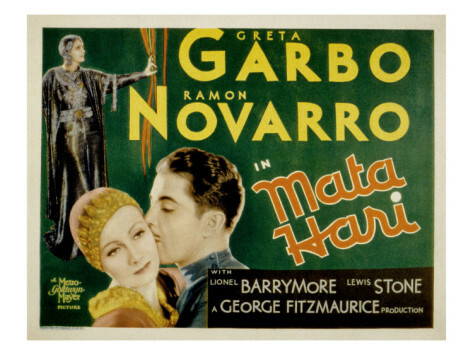 Mata Hari (1931) - Fictionalized story following the exploits of the notorious WW1 spy, from MGM and director George Fitzmaurice. 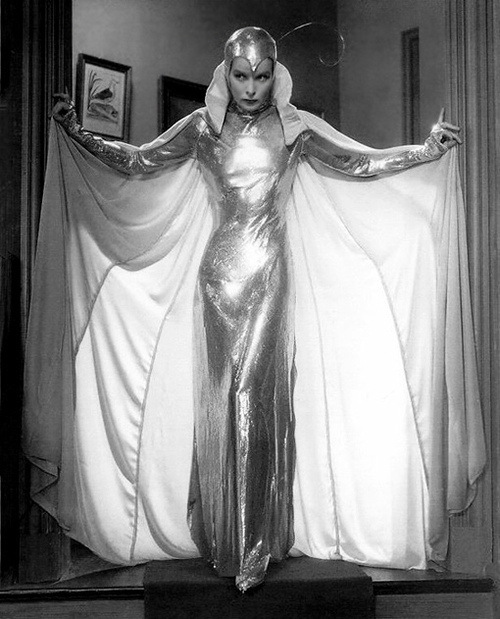 Greta Garbo stars as the title lady, an exotic dancer who enthralls all who see her perform, allowing her to gain access to valuable intelligence which she relays to her aloof handler Andriani (Lewis Stone). Among Mata Hari's conquests are General Shubin (Lionel Barrymore) and young ace pilot Alexis Rosanoff (Ramon Novarro). Also featuring C. Henry Gordon, Karen Morley, Alec B. Francis, Blanche Friderici, Helen Jerome Eddy, and Mischa Auer. Source: archive.org. The print is pristine but there are Portuguese subtitles embedded. The Miracle Woman (1931) - Frank Capra directed this look at phony evangelists, from Columbia Pictures. A slick conman (Sam Hardy) convinces preacher's daughter Florence (Barbara Stanwyck) to be the figurehead of a evangelical religious program carried over the radio. They are wildly successful, utilizing a series of fake "cripples" to be miraculously healed. But when blind former pilot John Carson (David Manners) comes to hear her in person, his genuine affection and belief make Florence reassess her life. Also featuring Beryl Mercer, Russell Hopton, Eddie Boland, Thelma Hill, Mary Doran, Dennis O'Keefe, and Charles Middleton. My Sin (1931) - Melodrama that seems like other, more successful, films stitched together, from Paramount Pictures and writer-director George Abbott. 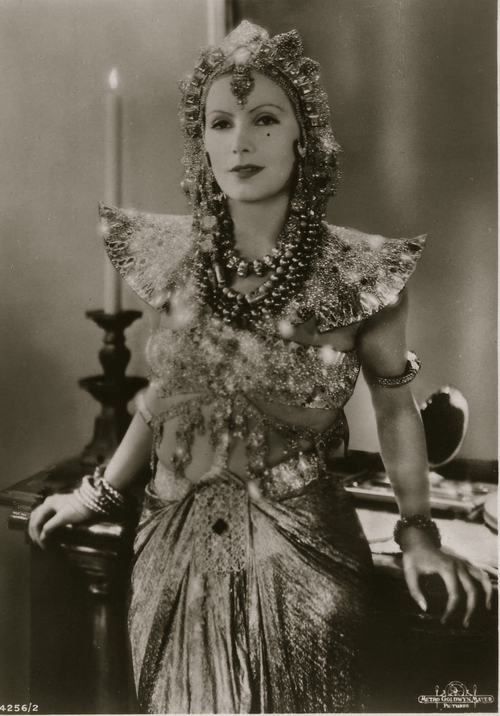 Tallulah Bankhead stars as Carlotta, a "disreputable" lady in Panama. When she kills a creep trying to strong-arm her, it's up to drunken attorney Richard Grady (Fredric March) to clean up his act and defend her in court. Years later, with a new life and identity in NYC as an interior decorator, Carlotta falls for a young rich lug (Scott Kolk), but will their romantic bliss be ruined by the revelation of her sordid past? Also featuring Harry Davenport, Anne Sutherland, Margaret Adams, Jay Fassett, Lily Cahill, Berton Churchill, Eric Blore, and Joseph Calleia. The Sin Ship (1931) - Louis Wolheim stars in and directed this regrettable melodrama from RKO. 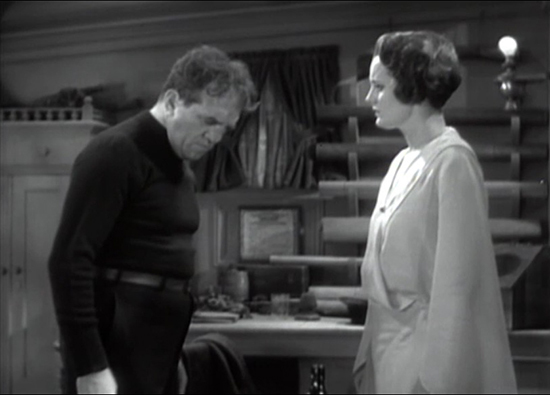 Wolheim stars as Captain Sam McVey, a drunken, angry slob of a sea captain who agrees to provide transport on his ship to a supposedly moral and religious duo: Smiley Marsden (Ian Keith) and Frisco Kitty (Mary Astor). If the names haven't clued you in, the duo are actually crooks on the lam, but Kitty plays her pious ruse so well that Captain McVey decides to turn his own life around, quitting drinking and cleaning up his ship. What will happen when he learns the truth? Also featuring Hugh Herbert (who also scripted this), Russ Powell, and Alan Roscoe. Street Scene (1931) - Slice-of-New-York-life from producer Samuel Goldwyn and director King Vidor, based on Elmer Rice's Pulitzer prize-winning play. An assortment of NYC residents talk, gossip and complain to each other over the course of a hot summer day and night. Sensitive young man Sam (William Collier Jr.) pines for beautiful young woman Rose (Sylvia Sidney), while Rose's lonely mother Anna (Estelle Taylor) is having an affair with the milkman (Russell Hopton), although Rose's overworked father (David Landau) may be getting wise. Various other tenants watch and offer commentary. Also featuring Beulah Bondi (her debut), John Qualen (his debut), Matt McHugh (his debut), Greta Granstedt, Eleanor Wesselhoeft, Allen Fox, Nora Cecil, Max Montor, and Walter Miller. Ten Cents a Dance (1931) - Romantic melodrama from Columbia Pictures and director Lionel Barrymore. 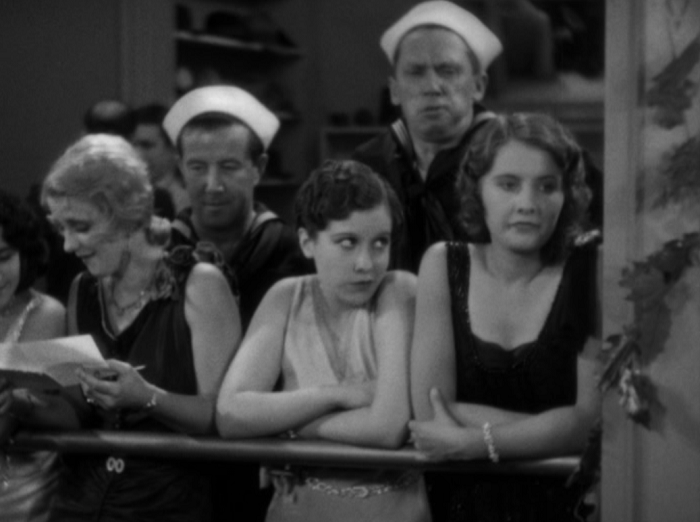 Barbara Stanwyck stars as Barbara O'Neill, a taxi dancer who hates her job. Wealthy businessman Bradley Carlton (Ricardo Cortez) loves her, but her heart belongs to Eddie Miller (Monroe Owsley), a poor young man with few prospects. When Eddie learns of Barbara's work, he makes her quit and the two get married. But wedded bliss is not to be, as Eddie turns out to be a crook as well as a wet blanket. When he gets into a real jam, what will Barbara be forced to do to get him out of it? Also featuring Sally Blane, Blanche Friderici, Phyllis Crane, Olive Tell, Victor Potel, Al Hill, and Martha Sleeper. Source: TCM by way of YouTube. 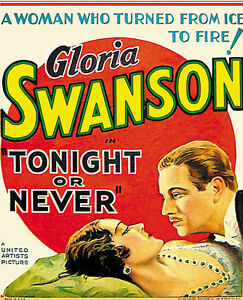 Tonight or Never (1931) - Samuel Goldwyn tries to emulate Ernst Lubitsch and largely succeeds in this Continental romance from director Mervyn LeRoy. Gloria Swanson stars as famous opera singer Nella Vago, the toast of the European music scene who is just finishing a smashing engagement in Vienna. However, some view her style as too technical and lacking real emotion, and so the elusive American market is closed to her. Although engaged to the foppish Count Albert (Warburton Gamble), Nella notices a mysterious male figure that seems to be following her. When Nella heads off to Budapest, she finds that the man, Jim Fletcher (Melvyn Douglas) is on the same train. When she decides to confront him, it may just lead to her finding the emotional footing that she needs. Also featuring Alison Skipworth, Ferdinand Gottschalk, Robert Greig, Greta Meyer, Boris Karloff, and J. Carrol Naish. Grand Hotel (1932) - All-star melodrama from MGM and director Edmund Goulding. The film tracks the lives and loves of a quintet of characters staying at the title Berlin locale. Otto Kringelein (Lionel Barrymore) is a meek bookkeeper who has been diagnosed with a terminal illness, so he's decided to spend his life savings by living his final days extravagantly. Preysing (Wallace Beery) is a blustery industry magnate working on a business merger that, if not successful, will mean his failure. Flaemmchen (Joan Crawford) is a young secretary hired to work for Preysing at the hotel, and she's not above using her looks and affections to pay the bills. Grusinskaya (Greta Garbo) is a Russian ballerina with a moody temperament. And Baron Geigren (John Barrymore), secretly on the verge of the poorhouse, has made a deal with shady characters to try and rob the ballerina of her valuable jewels. Also featuring Lewis Stone, Jean Hersholt, Robert McWade, Purnell Pratt, Ferdinand Gottschalk, and Tully Marshall. Source: Warner Brothers Blu Ray. 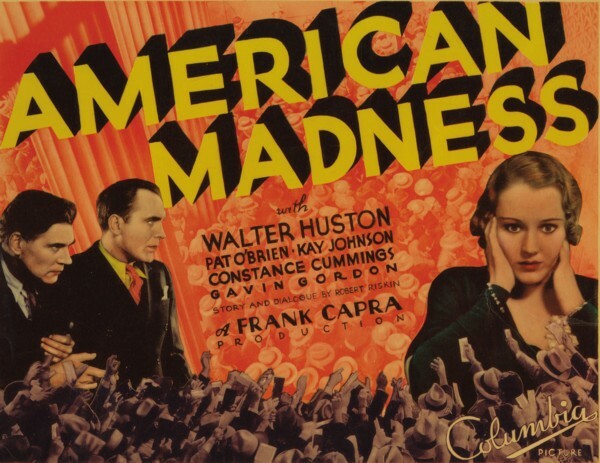 American Madness (1932) - Depression-era bank worries fuel this Pre-Code melodrama from Columbia Pictures and director Frank Capra. Walter Huston stars as Thomas Dickson, a hard-charging bank president who runs his business with an eye towards growth and the future, much to the annoyance of his more conservative board members. His workload forces him to neglect his wife Phyllis (Kay Johnson), who looks for comfort in the arms of sketchy bank employee Cyril (Gavin Gordon). Meanwhile, another employee, Matt (Pat O'Brien) is romancing a secretary, Helen (Constance Cummings). When a terrible crime is committed, it causes a run on the bank, and everyone may lose everything. Also featuring Arthur Hoyt, Robert Emmett O'Connor, Berton Churchill, Robert Ellis, Charley Grapewin, Edwin Maxwell, Harry Todd, Polly Walters, and Sterling Holloway. 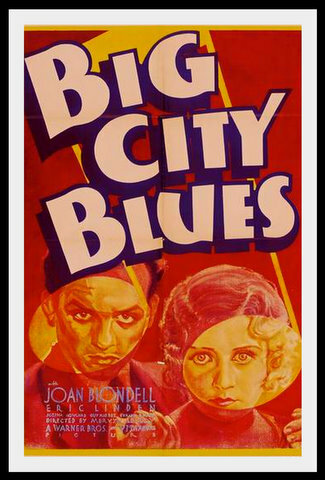 Big City Blues (1932) - Uneven comedy/crime drama from Warner Brothers and director Mervyn LeRoy. Eric Linden stars as Bud Reeves, a naive small-town Indiana boy who's arrived in NYC to make a name for himself. He gets taken in by his unscrupulous cousin Gibby (Walter Catlett) who tries to work the kid for every cent he's got, while Bud falls in love with showgirl Vida (Joan Blondell). However, when things take a dark turn, Bud may be left holding the bag and on his way to the hot seat. Also featuring Ned Sparks, Jobyna Howland, Guy Kibbee, Grant Mitchell, Lyle Talbot, Humphrey Bogart, Inez Courtney, Thomas E. Jackson, Josephine Dunn, Sheila Terry, Betty Gillette, Clarence Muse, J. Carrol Naish, and Evalyn Knapp. 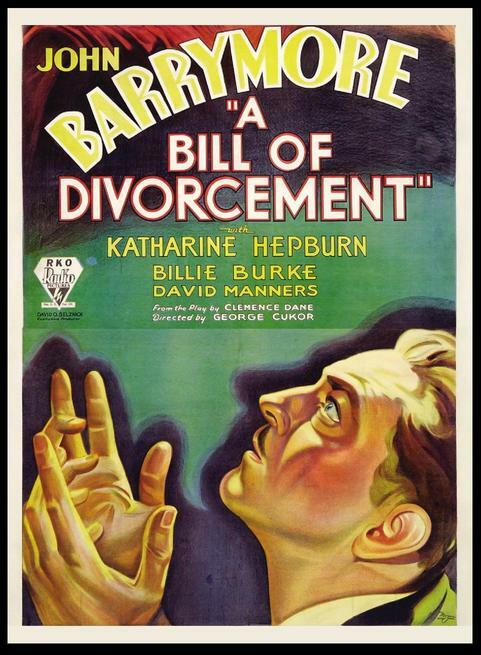 A Bill of Divorcement (1932) - Family drama from RKO and director George Cukor. It has been 15 years since Hilary Fairfield (John Barrymore) was put into a mental asylum for WWI-related "shell-shock". His wife Margaret (Billie Burke) is looking to move on with a new fiancee (Paul Cavanagh), while his daughter Sydney (Katharine Hepburn) has grown to adulthood and largely forgotten him. She, too, is looking forward to future wedded bliss with Kit (David Manners), but when Hilary suddenly turns up on the front step, having left the asylum, Sydney learns the truth about his hospital stay, which has implications for everyone. Also featuring Henry Stephenson, Gayle Evers, and Elizabeth Patterson. Cynara (1932) - Romantic drama based on a book by R. Gore Brown, from producer Samuel Goldwyn and director King Vidor. English barrister Jim Warlock (Ronald Colman) is a happily married man, looking forward to celebrating his anniversary with wife Clemency (Kay Francis). However, Clemency has to travel to Venice with her sister Garla (Florinne McKinney), and Jim goes out to dinner with colleague John (Henry Stephenson), where Jim meets Doris (Phyllis Barry). Doris comes on strong, and despite his better judgment, Jim succumbs and has a short affair with her. The consequences for his decision will change everyone's lives forever. Also featuring Viva Tattersall, Clarissa Selwynne, George Kirby, Halliwell Hobbes, and Paul Porcasi. 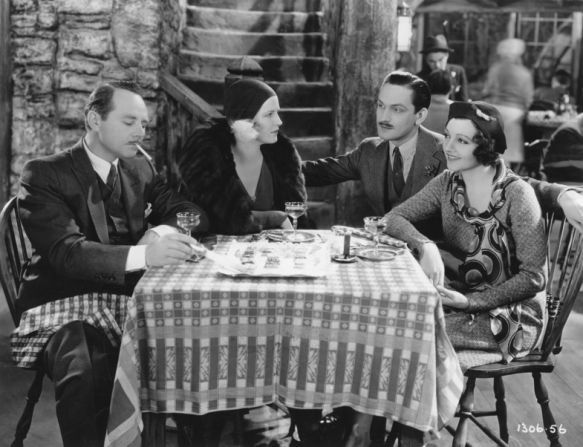 Downstairs (1932) - Excellent drama from MGM and director Monta Bell, from a story by John Gilbert. Gilbert stars as Karl Schneider, an amoral manipulator and all-around bad guy who gets hired on as the new chauffeur of the Baron (Reginald Owen) and Baroness (Olga Baclanova). He arrives on the same day as the wedding of Albert (Paul Lukas), the Baron's loyal butler, to Anna (Virginia Bruce), a maid also in their employ. Karl immediately sets to causing trouble, from blackmailing the Baroness to causing strife in Albert and Anna's marriage, to cruelly using an older cook (Bodil Rosing). How much can Karl get away with before someone has enough? Also featuring Hedda Hopper, Otto Hoffman, Lucien Littlefield, Marion Lessing, and Karen Morley. Love Affair (1932) - Very minor romantic melodrama from Columbia Pictures and director Thornton Freeland. Dorothy Mackaill stars as Carol Owen, a wealthy socialite and adventure-seeker who is secretly living beyond her means: she lost almost everything in the stock market crash, and only continues on in her lifestyle thanks to money from wealthy suitor Bruce Hardy (Hale Hamilton). Carol isn't interested in Bruce romantically, though, as she has her sights set on aeronautical engineer Jim Leonard (Humphrey Bogart). Jim has just designed a breakthrough aircraft engine and hopes to start his own company to manufacture them but he can't secure the financing. Carol will do anything to make Jim happy, even if it means sacrificing her own happiness. Also featuring Halliwell Hobbes, Astrid Allwyn, Jack Kennedy, Bradley Page, Barbara Leonard, Harold Minjir, and Dennis O'Keefe. Christopher Strong (1933) - Romantic drama from RKO and director Dorothy Arzner, from a script by Zoe Akins. Lady Cynthia Darrington (Katharine Hepburn) is a daredevil aviatrix who falls in love with respected politician Christopher Strong (Colin Clive). The problem is he's married, and his wife (Billie Burke) and his sensitive daughter (Helen Chandler) may not be able to deal with his infidelity. Also featuring Ralph Forbes, Irene Browne, Jack La Rue, Desmond Roberts, and Margaret Lindsay. 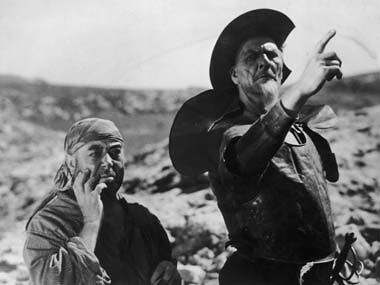 Don Quixote (1933) - Director G.W. Pabst's adaptation of the much-lauded novel by Cervantes. Feodor Chaliapin stars as Don Quixote, a mentally unbalanced old man who believes that he's a knight engaged in fantastic, romantic adventures. He's assisted/enabled by his cohort Sancho Panza (George Robey). Also featuring Miles Mander, Oscar Ashe, Rene Donnio, Frank Stanmore, Sidney Fox, Emily Fitzroy, and Renee Valliers. 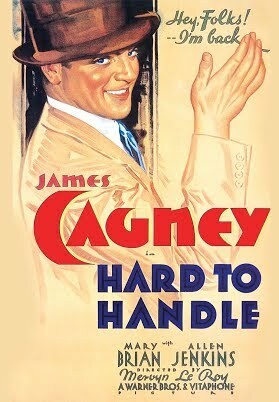 Hard to Handle (1933) - Manic comedy from Warner Brothers and director Mervyn LeRoy. James Cagney stars as Lefty Merrill, a fast-talking huckster who can sell ice to the Eskimos. Every time his fortunes fade, he comes up with a new angle and a new spin that builds him up even higher than before. Along for the ride are Ruth (Mary Brian) and her gold-digging mother Lil (Ruth Donnelly). Also featuring Allen Jenkins, Claire Dodd, Robert McWade, Berton Churchill, Mary Doran, Douglas Dumbrille, Gavin Gordon, and Sterling Holloway. 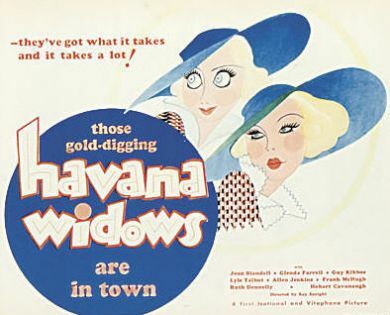 Havana Widows (1933) - Fun, if minor, comedy from First National and director Ray Enright. Joan Blondell and Glenda Farrell star as a couple of show girls who decide to head for Havana to try and put some unsuspecting rich guys into compromising positions which will result in a big payday for them. They hone in on befuddled older man Guy Kibbee, but Blondell falls for his handsome (but poor) son Lyle Talbot. Also featuring Frank McHugh, Allen Jenkins, Ruth Donnelly, Hobart Cavanaugh, Ralph Ince, Luis Alberni, J. Carrol Naish, and Paul Porcasi. 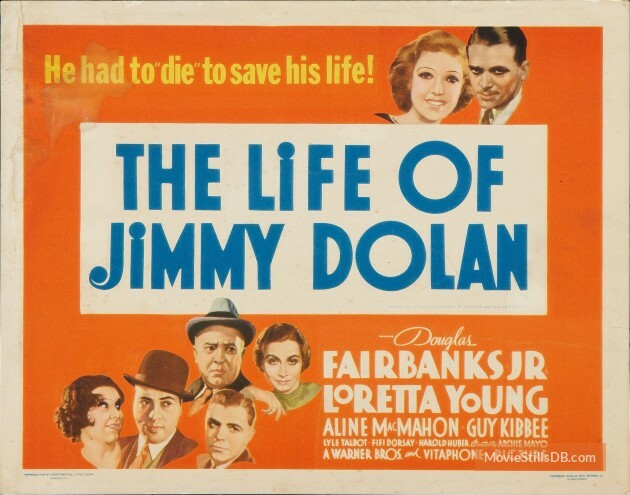 The Life of Jimmy Dolan (1933) - Effective sports/romance/tearjerker from Warner Brothers and director Archie Mayo. Boxer Jimmy Dolan (Douglas Fairbanks Jr.) wins the championship bout, and during a night of celebration, a man is accidentally killed. Others at the party make Dolan look like the guilty party, and when they attempt to get away from the police, they are killed themselves, with Dolan believed to be among the dead. Dolan, unsure that he an prove his own innocence, sets out on the vagabond life, eventually ending up at a Utah ranch for crippled children run by Auntie (Aline MacMahon) and Peggy (Loretta Young). Dolan stays on as a ranchhand and mentor to the kids, but when necessity forces him back into the ring, his identity may be revealed. Also featuring Guy Kibbee, Lyle Talbot, Arthur Hohl, Fifi D'Orsay, Harold Huber, Shirley Grey, Mickey Rooney, Anne Shirley, Edward Arnold, Robert Barrat, Clarence Muse, Sammy Stein, and John Wayne. Perfect Understanding (1933) - Bland, dull "modern" romance drama from United Artists and director Cyril Gardner. Posh British society couple Judy (Gloria Swanson) and Nicholas (Laurence Olivier) decide to get married, but with a "perfect understanding" that they won't tie each other down, and allow the other to maintain their freedom. When Nicholas has a fling with an old flame, Judy spends the night with another man, and their open marriage is sorely tested. Also featuring John Halliday, Nigel Playfair, Michael Farmer, Genevieve Tobin, Charles Cullum, and Nora Swinburne. Source: YouTube. The copy was from a Cohen Collection restoration and the movie looks fantastic, one of the best prints that I've ever watched on YouTube. The Prizefighter and the Lady (1933) - Boxing/romance with some crime touches, from MGM and director W.S. Van Dyke. Real-life boxer Max Baer stars as Steve Morgan, an affable lug who gets schooled by the Professor (Walter Huston) in the "sweet science". Morgan quickly rises through the ranks of fighters, and a championship bout seems a sure thing, but his marriage to former torch singer Belle (Myrna Loy) may cause complications, either from her former beau, gangster Willie Ryan (Otto Kruger), or through his own philandering. Also featuring Vince Barnett, Robert McWade, Muriel Evans, Jean Howard, Matt McHugh, and both Jack Dempsey and Primo Carnera as themselves.